A disgraced detective believes vampires are responsible for a string of killings. Blood Harvest is the latest horror from Belfast based writer-director George Clarke, and it’s an odd one all right! It begins with the messy kidnap, torture and murder of an unnamed woman, filmed in what looks like someone’s back room. It’s oddly shot with slow motion, overused even in the few minutes it lasts. The killing itself is excessive, and without any idea who these people are or why it's happening, it just comes across as cheap exploitation done badly. The squeals from the victim in this scene were so high-pitched my cats jumped off the couch! The credits that follow use a great '70s style font overlaying a distractingly boring background and last almost as long as the first scene. Cut to Detective Hatcher (Jean-Paul Van der Velde) on the phone in a dull office space that looks like a closet but is supposed to be a police station. He’s using a mobile phone. In the police station. I guess the budget couldn’t stretch to an actual office with workers and telephones with landlines. He’s interrupted by another policeman (a dishevelled Jack, played by Robert Render, who henceforth will be know as Ponytail) yelling at Hatcher that “there’s been another body and it’s closer to town.” Hatcher runs off to investigate and Ponytail takes over the phone for an excruciatingly long barely-heard call, during which he is fired. Apparently Northern Irish Police Captains do that over the phone and don’t bother to take your badge or gun. Cut to an unknown couple on the run from someone in some unknown tunnels where Clarke attempts meta humour about Hollywood horrors (that will just make you wish you were watching one of those instead of this tripe) before there is an attack. Here there is a nice POV running shot and a believable murder - good stuff. Meanwhile, Hatcher and his new partner are investigating that ‘new body’, number 39 apparently, where a discussion is had about the public hating the police and then new partner randomly takes his gun out and chases after someone in the bushes. Correct me if I’m wrong but I'm pretty sure things don’t work that way. Usually there’s some talking, some warning, some establishment of who’s who etc... Not just run with a gun. There are plot holes aplenty in this particular scene, not the least of which is the lack of ‘Nation wide man hunt’ that would be occurring with a body count close to 40, the tampering of the crime scene, the lack of professionalism, and then the whole ‘run off with your gun out’ malarkey. Our killer sure is prolific, as in the next scene he’s spying a young jogger in the woods. With his homemade gas mask (made of tin cans - seriously) he sticks out like a sore thumb, and though the chase scene lasts longer than it should, it’s hard to believe she wouldn’t just have turned and run from him at first glance. And of course, even though she’s a jogger and a mask occludes his vision, he still succeeds in capturing her. This killer's outfit actually consists of a T-Shirt with a rocket on it, the tin can mask and skinny jeans. Hell give him a man-bun and it’s a hipster killer! Ponytail, newly fired and full of anger, is sitting about his house staring at his home-made ‘map of crimes’ sipping instant coffee from his kitten mug when Hatcher pops round, and they discuss whether the killer is a zombie or vampire, completely po-faced. Clarke continues his ‘experimental’ cinematography even in this rather placid moment. In one scene the camera alternates between super close-ups of a speaker's eyes and his mouth, back and forth for no discernible reason; there’s still the overuse of slow mo and a strange propensity to shoot scenes on the diagonal. Back in the action, the killer is unceremoniously unmasked, which is both anticlimactic and just plain weird, and immediately begs the question as to why bother with the mask in the first place? The killer himself seems mentally challenged in some way; midway through the torture of a (inexplicably compliant and silent) victim the killer just stops and stares at nothing for a long long time. He also only communicates in grunts, which seems to be bordering on offensive given his seemingly mentally disabled persona. This is intercut with Ponytail putting bottles of garlic water (?) in his pocket and stalking off into the woods with his gun out. We find out there are two killers, both animalistic, though they are strangely cleaner cut than the policemen. Eventually we know one killer has to come out on top, and of course that scene is stretched out long beyond tolerance. Then a twist happens, and it’s the talkiest and most unbelievable twist I’ve yet seen. There are seven minutes of convoluted exposition (I counted) after which there’s 10 minutes of well done but very uninteresting literal brawling. Then director Clarke cracks out the slow-mo once again for the ludicrous climax. Plot holes abound here and are too many to mention, but the lack of believability blasts a hole in the audience’s ability to look past the obvious low budget flaws and just enjoy a silly movie. The final speech by Jack is cringeworthy earnestness that is both silly and inappropriate for the character and the scene. The acting is decent for the most part, with the killers (Alan Crawford and Liam Rowan) giving the most committed performances; but Van der Velde as Hatcher is just wooden and awkward on screen. The end credits and bloopers are the best part of the film - not a high recommendation. 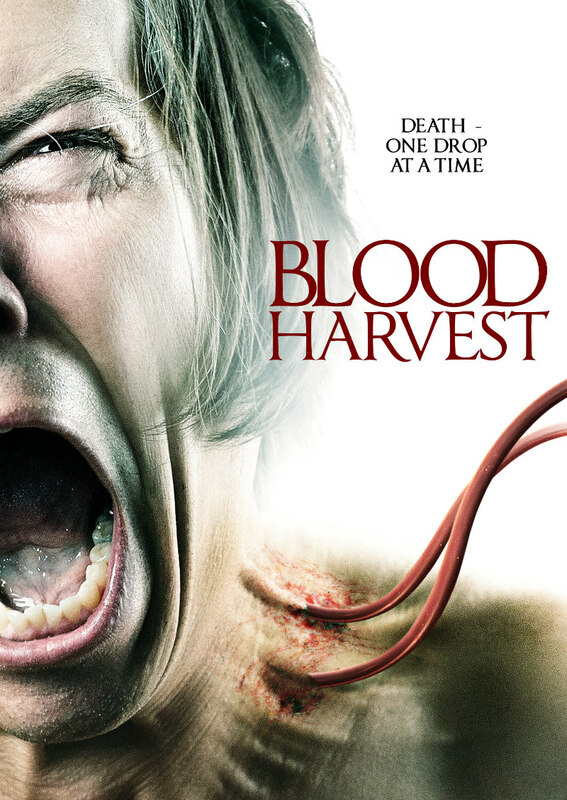 Blood Harvest is on VOD November 21st.